October 2017, Issue 186 | Samuel Shapiro & Company, Inc.
Shapiro was fortunate to have attended U.S. Customs and Border Protection’s (CBP) 2017 C-TPAT Conference in Detroit and we wanted to take the time to share some highlights from the event. Anti-Terrorism: Be sure to report any breach of supply chain security to your C-TPAT Supply Chain Security Specialist (SCSS). Cybersecurity: Cybercrimes and phishing attempts are on the rise. Appropriate IT security controls are a must for C-TPAT participants. Resources for recently identified vulnerabilities as well as information on reporting cybersecurity issues can be found on the United States Computer Emergency Readiness Team website. C-TPAT Minimum Security Criteria: CBP is still developing the new Minimum Security Criteria (MSC), in which the COAC (Commercial Customs Operations Advisory Committee) had a great deal of input along with information gleaned from past inspections and C-TPAT participants. Elizabeth Schmelzinger, Director of C-TPAT is working to have the new minimum security criteria published as soon as possible, but material will likely not be available until 2018. CBP advised the criteria will be implemented through a phased rollout, and they’ll give everyone plenty of time to comply with the new MSC. Corporate Security: There will be a heavy analysis of strategic vision and responsibility within each company. Is there a lack of information and coordination within your company? CBP looks to ensure there is buy in from top to bottom. Buy in from the top came up in several sessions and it is a key element to a successful C-TPAT program. Risk Assessment: Ensure there is a robust risk assessment platform in place. Detailed assessments must be completed so CBP knows that you fully comprehend what the risks may be in your supply chain. CBP wants to come up with ideas from all sides for risk assessment and share this mission with the trade. Business Partner Requirements - How you go about selecting and screening your business partners. Policies and Procedures for Cybersecurity - Ensure that you’re not going to have your systems corrupted. Identity Theft - Theft of importer numbers is real and happening. Be sure to run your ACE reports regularly and report to CBP any shipment that is not yours. Cargo Container Security and Transportation Security - Review the entire chain of custody to ensure there are no gaps in time and ask for proof of inspections. Agriculture Security - At the forefront of CBP’s docket. Lack of agricultural security is a big risk for the U.S. and it’s a critical component moving forward. Seal Security - Even CBP has had seals stolen. Keep your seals in a safe place and inspect the seals on your container for any anomalies. Some seals have not been performing as expected. CBP has ordered new cable seals to see how they perform. Physical Security - Not much has changed, but it’s important to review your physical security protocols regularly. Personnel Security - It’s critical that you know who you are dealing with and who is working at your distribution facility. The threat of theft and fraud from internal sources are factors that need to be weighed with severe significance. NII - Non-Intrusive Inspection - Equipment is being deployed at ports (Gamma ray, hand held, etc.). Radio Frequency Identification (RFID) Technology - Already being used with plans to scale further in 2018. Cashier Payments - CBP is doing away with cashier payments at the border. You can pay online for a one-time trip or get decals, but they want the ports to run as efficiently as possible. The new DTOPS system (Decal and Transponder Online Procurement System) is making it faster and easier for frequent travelers to cross the U.S. border. Drive-Thru Container Imaging System - Images will go into a command center for inspection and review. The command center may not actually be at the port where the container is located. The command center will be able to take in transmissions from all types of service providers. Expanding Biometric Exit Collection - Pictures of passengers/drivers to be compared and a “GO” will be initiated upon a match. Mutual Trade Agreements - Working to expand these further between countries. Agriculture Imaging Data - Will ID bugs faster to create greater efficiency. Trusted Traveler and Trader Program - CBP is currently analyzing the supposed benefits of implementing such a program. Centers of Excellence and Expertise (CEE) - National authority that is account based and partially remote. National Targeting Center - will use algorithms as TSA has to enhance cargo and passenger screening. Mitigating Global Risks - CBP working with country partners (AEO/PIP/WCO). Providing a detailed description of products is crucial. For example, if dealing in electronics do not just list electronics; provide a specific product description (i.e. “Samsung Galaxy 5S”) as this will ensure faster processing. Frequently test your supply chain. Train all employees on CTPAT and implement a system of checks and balances. Documented processes must be up to date. Don’t just blow the dust off the book on the shelf. Ask your SCSS for full data on exams on a macro level. Don’t ask for SVI numbers as they are no longer used. Instead send a request to monitor a C-TPAT company. The receiving company must accept your request or decline your request. The majority of theft and breaches still happen during transport, so tracking is imperative. Be sure to test and check GPS systems frequently and always confirm delivery of your container(s). Be sure to have proof of the 7-point container inspection and the 17-point truck and trailer inspection. Be sure seals match and there are no anomalies. For additional information on CTPAT, please contact compliance@shapiro.com. Have you ever been trapped in a maze that appears to have no exit? Trade compliance can easily be compared to a highly complex maze, riddled with rules and regulations that have trapped numerous importers over time. The easiest way out is to implement an effective trade compliance program that ensures your company is meeting the legal obligations of Customs and other government agencies. The most important factors that will aid in your escape are classification, origin, and valuation of goods to ensure your items are all accurately declared and appropriate duties and taxes are paid. Furthermore, reviewing C-TPAT procedures to ensure a secure supply chain, or even becoming C-TPAT certified can play an important role in your escape as well. When done correctly by partnering with professionals, trade compliance will help you avoid penalties and take advantage of duty savings under duty reduction programs such as GSP, NAFTA, and other free trade agreements – it will be like you never entered the maze in the first place! Not having regulatory impediments to your business will lower your costs and ensure your product moves to market faster and more effectively. If you need help creating and/or implementing your trade compliance program, Shapiro has a committed team of experts fluent in trade compliance that will support importers, exporters and Customs lawyers to succeed and grow in the international arena. If you’ve been living under a rock since 2005 or aren’t fluent in compliance geek, you’re likely unaware of the International Standards of Phytosanitary Measures (ISPM 15) Regulation of wood packaging material in international trade, which we wanted to bring to your attention as U.S. Customs has plans to start issuing penalties against importers. As of November 1st, if any WPM from foreign origin is found to be lacking appropriate IPPC-compliant markings, or found to be infested with a timber pest, it will be considered not properly treated to kill timber pests, and in violation of the regulation. The responsible party (importer, carrier, or bonded custodian) for the affected WPM may be issued a penalty by U.S. Customs and Border Protection (CBP) under Title 19 United States Code §1595 a(b) or under 19 USC § 1592. The purpose of the WPM requirement is to prevent the introduction of exotic timber pests. Introduced exotic pests lack the natural environmental controls that may be found in their respective native lands to keep them in check. When exotic timber pests go unchecked they can cause widespread tree mortality with detrimental ecological impacts. Preventing introduction is critical with these exotic pests. More informational material on WPM is available from U.S. Customs and Border Protection. Another resource is The National Wood Pallet and Container Association, which has a directory to locate NWPCA member companies that manufacture, recycle or provide equipment and supplies to the wood packaging industry. Whether you’re looking for new pallets or used pallets, large or small quantities, NWPCA’s Directory can assist you with reputable suppliers and information regarding ISPM 15 certifications. As China prepares for the Golden Week Holiday (Oct 1-7), factories face looming fears of increased environmental oversight by the Chinese government that could close thousands of factories permanently. In 2013, China’s Ministry of Environmental Protection instituted stricter regulations to improve the heavily polluted atmosphere by 2017. The requirements aim to reduce airborne pollutants by more than 15% year-over-year. Some factories in Northern China have already been forced to close their doors as inspectors have honed in on non-compliant manufacturers. As the regulations take effect in the North, the Shanghai, Chongqing, Chengdu, and Guangzhou regions are the next major production areas in sight. Factory audits will primarily target electronic circuit board manufacturers, decorative home products factories, and printing and dyeing mills. Textiles, rubbers, metals, and plastic are not exempt from these regulations and will also need to comply with the stringent pollution limits set forth by the Chinese government. Factories that have been shut down struggle to reopen with minimal government guidance to meet the Ministry’s regulations. The policy details are seemingly unclear; according to manufacturers, there is not specific instruction to improve production quality standards, and factories have no insight as to if or when they will be able to resume production. With the shutdown of Chinese manufacturers, the decrease in exports from China will likely push freight rates to uncharacteristically low Q3 rates – a time rates are usually highest amidst the rush to get cargo in for the holiday shopping season. Carriers are already seeing the effect of the northern factory closures as the September shipping rates have continued to fall despite previously anticipated GRIs for the Asia-U.S. and Asia-Europe tradelanes. Golden Week blank sailings traditionally maintain high rates through October; however, the Shanghai Containerized Freight Index has recorded consistent declines over the past few weeks. With increased vessel capacity and declining demand for space, carriers will struggle to maintain the current market rates. As China continues ahead with environmental regulations, Guangzhou will be the next major manufacturing region targeted in Q4 and early next year. 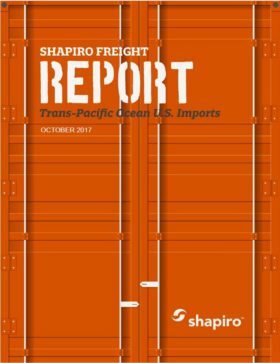 Shapiro clients with cargo moving ex-Guangzhou should begin the conversation now with their suppliers and have alternative solutions in place should their manufacturers shut down due to regulatory inspections. After many complaints and unyielding industry pushback, China has decided to hold off by two years, until October 2019, on implementing its new regulation for food imports. The new regulation would require an inspection certification from the respective foreign government for all shipments containing food. China’s decision to forgo the additional regulation, at least for the time being, came just days before it was supposed to go into effect and after trading partners, including the United States and Europe, stated that the new regulation would cause havoc in trade dollars. The regulation would not only disrupt high-risk foods, but also foods ranging from raw to processed. A coalition of countries finds the requirement unfair and deceptive and would like to see China follow the global trade practice. If executed, this rule would cut China off greatly from the global food supply. China’s decision to delay the regulation comes after a culmination of allegations against Beijing, including complaints that China is reducing market access for other countries and damaging competitors because of low-priced exports of metals and other high-value commodities. Despite the fact that China was caught selling counterfeit food in the recent past, just this month they banned imports of certain cheeses, such as brie and camembert, because of supposed bacterial concerns. However, these bacteria are also found in similar cheeses that were not banned. Trading partners are hoping that this outcry will not just delay, but completely void the planned regulations that they feel are only benefiting China and allow for further standardization of practices across global trade. Volume cascading to the U.S. East Coast, primarily from the Asia-Europe trade which boasts the largest average vessel sizes, has created an almost 20% increase in capacity for 2017 vs. 2016. Additionally, demand was markedly more sluggish than expected in the last two weeks of September and into early October as U.S. importers looked to manage surging domestic inventory levels. Many shippers also reported that they moved cargo in August to avoid potential Golden Week delays. With supply rising and demand falling, it was no surprise to see spot rates fall by 15-20% over the last three weeks. To reverse the current capacity supply equation, carriers must look to their winter deployment and blank sailing practices. The problem for steamship lines is that they are scheduled to increase capacity further (though gently, perhaps 2-3% in Q4). Robust demand to the U.S. West Coast could indicate that East Coast demand will rebound slightly, though the track record for Q4 demand makes this speculation hopeful. Total U.S. volume sits at 7% higher YTD for 2017 vs. 2016, but analysts have down-graded the annual forecast to roughly a 5.5% gain. The steamship industry is still on track to make a $4-5B profit after losses of over $4B in 2016. While importers and forwarders may not be shedding tears for the ocean carriers, it is crucial that the carriers create more control of their capacity over-hang. None of us want to see Yangming (for example) follow in the shoes of Hanjin (a very sad example). Based on data from the U.S. Census, imports from Vietnam to the U.S. grew from $38 billion in 2015 to $42.1 billion in 2016 (an increase of 10.7%), and in the past 10 years, imports from Vietnam to the U.S. grew by a total of 343.7%. It’s been no surprise that imports from Vietnam continue to trend upward as sourcing in the region is making conspicuous shifts away from China due to lower relative labor costs and incremental recognized improvements in production quality and infrastructure within the borders of Vietnam. Fibre2Fashion.com, a leading resource for many in the textile industry, recently highlighted, “in the first eight months of this year, textiles and garment exports swelled to $19.8 billion in the first eight months of this year, with export value increasing by 9.9 per cent over the value during the same period last year. Vietnam’s cotton imports surged over the past ten years from 150,000 tonnes in 2005 to approximately 1.2 million tonnes in 2016” (based on data reported by the Vietnam Textile and Apparel Association). Below is the 2016 ranking of U.S. imports by country (expressed in Billion $). Although Vietnam represents only 1.9% of total U.S. imports, they continue to trend higher each year with double digit growth as many more U.S. companies are finding clear advantages in sourcing product from the country. Demand for July and August cargo continued to be strong, towing the line for a positive trend to continue in air cargo growth this year. Air rates from parts of China have been inching upwards in September with very slight hit to the markets including short holidays, typhoons, and carrier cancellations. Oct 1st marks the first significant holiday of the season with a week-long China shut down that drives air rates up in the weeks prior and has the carriers holding on to their momentum as much as possible through Chinese New Year. Watch for capacity reductions as the passenger travel season dips and new electronics launch in the near future, which will affect rates in the carriers’ favor. Within one week after Hurricane Harvey, the price of diesel fuel rose to a national average of $2.80 per gallon, up from $2.58 per gallon just prior to the storms. Hurricane Harvey caused a $.15 per gallon increase by September 4th and an additional increase of +$.05 per gallon was applied by September 11th, after Hurricane Irma ravaged parts of the Southeast. The increase in fuel costs for the trucking industry translates to an approximate increase in fuel surcharges of +2% in the month of September. In many cases this increase has extended into October. Average fuel costs started to drop ever so slightly the week of September 18th and are expected to decline further into October. The average drop nationwide does present certain anomalies. Truck fuel in the Mountain and West Coast states continues to rise, so it seems unlikely that carriers in that area will decrease rates in the near future. Fuel rates in the Mid-Atlantic states continue to rise, whereas rates in the South and New England states have seen drops as much as $.15 per gallon. Despite regional rates trending differently, the increases in fuel are forecasted to stop by the end of October as supply evens out. Houston airport re-opened August 30th and is now fully operational after Hurricane Harvey hit in late August. Hurricane Irma devastated parts of Florida and the Caribbean Islands in September, not only affecting tourism and trade but also causing severe damage to many airports, some of which have not re-opened. Miami, Orlando, Tampa, and Jacksonville re-opened Tuesday Sept 12th. Anguilla, Antigua, the Bahamas, Dominican Republic, St. Barts, Turks and St. Croix are open. SJU- San Juan Puerto Rico is open but with limited capabilities. Just as Irma’s effects were waning, Hurricane Maria devastated the Island, and the airport is scarcely operational. Limited passenger service is operating as of September 25th and FEMA is claiming the rest of SJU’s services for direly needed humanitarian aid. Mexico City’s airport suffered damage during the 7.1 magnitude earthquake on September 19th; however, after evaluation, it was re-opened at reduced capacity that same day. Many of these cities and more will take months to return to normal operations; please check carrier websites for specific information on what they are accepting. Polar/Atlas is courting pesky labor issues due to pilot contract renewal. Pilots say that the Atlas Air Worldwide Holdings Inc. contract is not up to industry standards, while the company accuses the pilots of intentional work slowdowns and call outs resulting in cancelled flights. While this goes on, it could affect Atlas and Polar’s freighter service. The planned gray pool between Flexi-Van Leasing and Direct ChassisKink Inc (DCLI), two of the largest providers, has been tabled for the time being. According to Ron Joseph, Senior Vice President and Chief Operating Officer for DCLI, one of the biggest obstacles to this pool was the need to move DCLI’s existing chassis pool out of the APM terminal in Elizabeth, NJ. The terminal is undergoing a multimillion dollar renovation and needs the space. The International Longshoremen’s Association (ILA) authority over the chassis maintenance and repair only adds further complexity. Even though Flexi-Van and DCLI voided their planned partnership, the New York – New Jersey port council agreed that a gray chassis pool is one of the port’s highest priorities. According to Steve Coleman, Port Authority spokesman, the Port Authority’s focus is making sure the port has the necessary chassis to meet the needs of the port, especially now that the Bayonne Bridge project is completed and larger vessels can begin calling NY/NJ terminals. Blockchain technology is a distributed database or ledger across a network of computers. This network could range from hundreds to millions of computers with no single person controlling the data. All changes to the data are encrypted and cannot be deleted by anyone. However, there will always be a record of who changed the data and what the data looked like before the update. Hence, blockchain moves the ownership of data from a single entity or person to a designated group, which gives it mass appeal to the supply chain industry wherein data in a single transaction is often touched and influenced by multiple parties working on different systems. So how could blockchain further benefit supply chains? With many members in the blockchain you would be able to shop for the best price available for the services you need. Cargo tracking would become immensely efficient and despite the cargo changing hands from provider to provider, the data and system used would never have to lapse. Blockchain is already being used in the diamond industry with great success to track the diamond’s journey from mine to consumer. Within this transactional realm, blockchain cuts down on fraud and verifies sustainable practices. In this same light, blockchain also provides the government with greater transparency. Though blockchain is being explored on a micro level, global use and acceptance of this technology is still several years away. The reasons for this are many. Firstly, some sort of industry standard will need to be adopted by all parties, so that all parties will use the technology to the same effect. Implementers will need to make sure all maritime laws and commercial codes governing rights of ownership and possession over a multitude of jurisdictions are followed. Another issue is that all of the information will be public to everyone with access to the blockchain. If this is a public blockchain, then that party will include anyone with an internet connection, so a way to further encrypt information and limit access needs to be unearthed. Private blockchains can be used and this will probably be the way most companies go if they do not want everyone knowing their company information, but the information flow will not be as seamless as if there was a public block chain used by the entire industry. As previously featured in Shap Talk, Shapiro has been sharing with you the names of employees who have been recognized for their exceptional efforts and contributions to our Company. At Shapiro, we continually work to develop, challenge, and inspire all of our employees to grow individually and with the Company. This month, we would like to recognize Solan White, System Administrator in Baltimore for his outstanding performance and contributions. It’s useful to remember that 7% of the capacity supply dropped out of the market on August 31, 2016 when Hanjin collapsed. This was what kept 2016 from being an unmitigated disaster for the steamship industry since Q4 demand has been weak for going on six years now. For 2017, demand dropped quickly in the closing weeks of September. The Chinese government’s crackdown on polluting manufacturers played a role, as did surging inventory levels for American importers. The problem for steamship lines is that they are scheduled to increase capacity further (although mildly, perhaps 2-3% in Q4) just as demand significantly weakens.